Even though I feel dead on my feet, I am looking forward to class. We’ll be filling the vol-au-vent cases with lamb ragout, making a marinated goat’s cheese salad and using the brioche we made yesterday to make a creamy bread and butter pudding and serving it with an orange and tamarillo compote. Once the lamb is simmering away in stock, cepes and vegies, I start the two syrups for the oranges and tamarillos and put the oranges on to blanch. I get distracted and leave them too long. They look mushy. 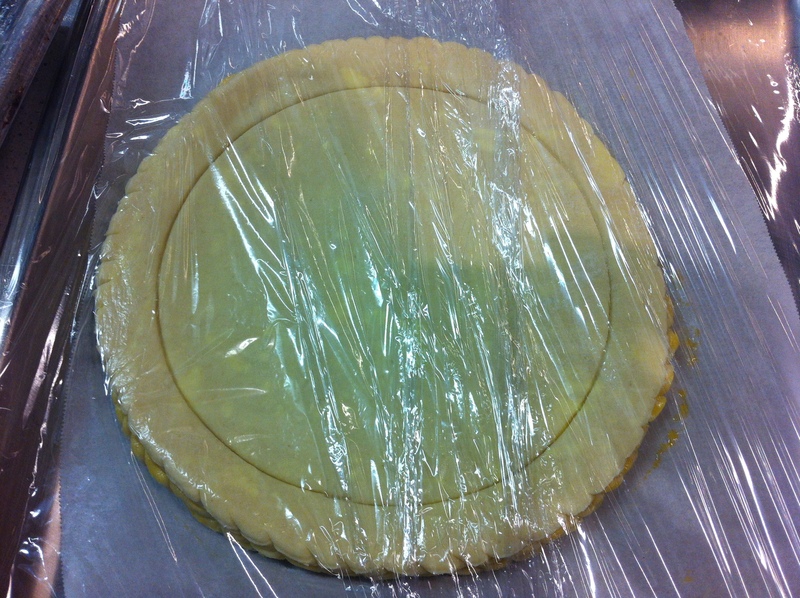 I have to peel off the rind to julienne it, and then fillet out each orange segment. I have to be so careful because they are too soft. It takes ages. I’m going to be one of the last to finish again. But the two syrups are looking and tasting incredible. 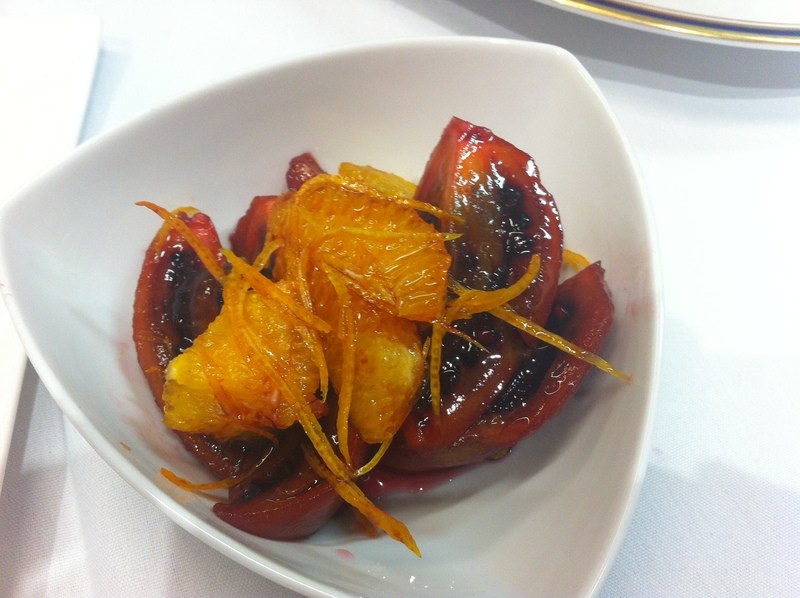 The orange syrup has palm sugar and spices like cloves and cardamon and the tamarillo one has red wine, cinnamon and mint. They are fragrant and beautifully coloured. 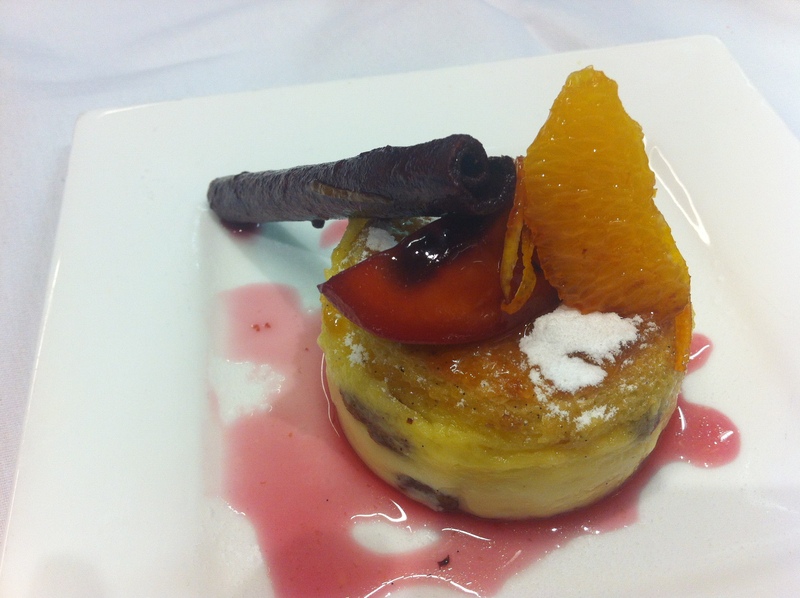 The brioche pudding is a flash version of the traditional bread pudding. Circles of brioche layer the bottom and top of small ramekins, a few cherries and sultanas are added and a custard is poured over the top. I’m thinking the salad is the easiest component today. We just have to marinate the goat’s cheese, grill it lightly on a crouton, and serve with the greens and vinaigrette. The vinaigrette tastes good – a bit of a tang but not too much. 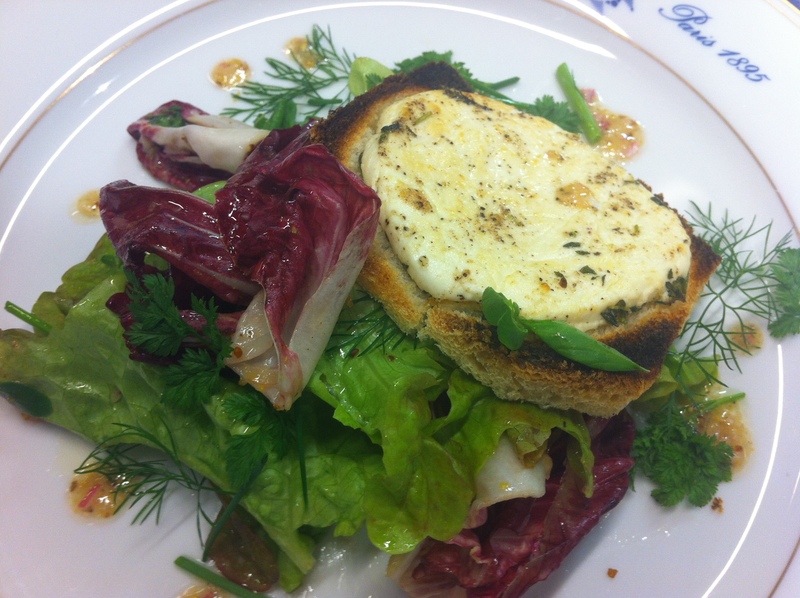 The goat’s cheese, marinated in hazlenut oil and herbs sits nicely on a shaped crouton. I’m up at Chef’s table for his opinion, feeling pretty happy. He tastes the cheese. Good! Then he pulls up a few pieces of green leaves out of the salad. Presentation could be better. I thought I had done better this time but clearly there’s room for improvement. The pudding meets his approval. The lamb ragout needs more sauce but he likes the taste. It’s only a really good day when all the components of the all the dishes meet the rigorous standards of Le Cordon Bleu. After all that’s how it has to be in a restaurant. Other students seem a bit subdued as the week comes to a close. The pot kitchen is usually filled with lively banter and teasing but tonight there’s no chatter, only the endless clanging of pots, spraying of water and he odd expletive as yet another pile of filthy dishes appears. I’m not surprised you all felt exhausted – what a gruelling schedule you are keeping up! It is such amazing and rigorous training. The lamb ragout looks truly sensational. Go you!! 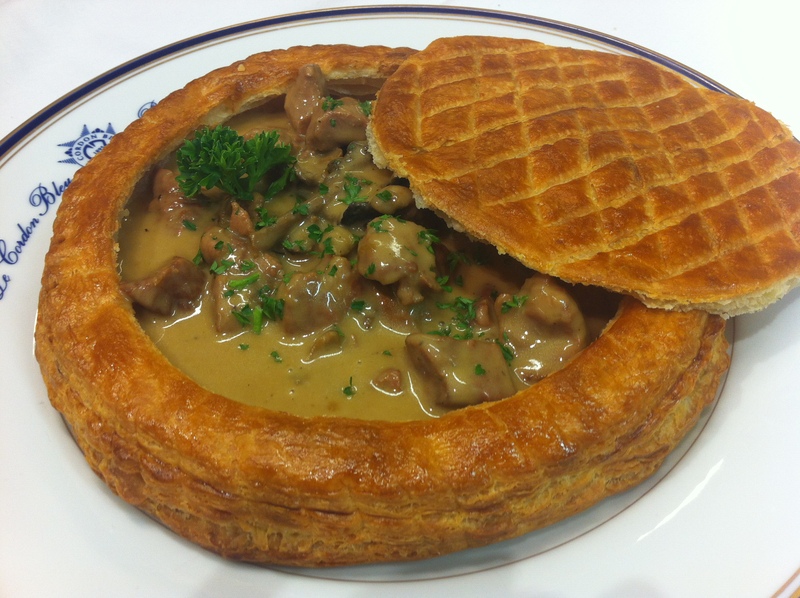 The vol-au-vent looks amazing! I can picture so many things that could go wrong in just the pastry alone (and if I were trying to cook it they would go wrong). Hey Gwynn Yes, everyday it seems so much could go wrong. Just remember that most of the photos are of Chef’s work.